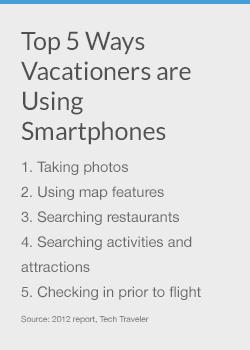 85% of international leisure travelers use their smartphones abroad. App use by tourists has increased exponentially. 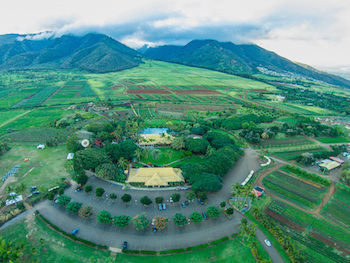 Albert Boyce runs the Maui Tropical Plantation, a one-of-a-kind tourist destination. You can visit the plantation to walk through lush tropical grounds with plant and animal life, listen to live music, play on ziplines, and take a tram tour. QR codes posted in color-coded zones throughout the park allow visitors to enjoy a live walking tour with vivid descriptions of the plant life. “Guidebook is dynamic, easy, and you never have outdated brochures,” says Albert. Visitors use a mobile guidebook to explore the grounds at Maui Tropical Plantation. When visitors come to your city, museum, beach, park, shopping district, walking tour, gallery, or resort, they’ll be using their smartphones. You can put your information in their hands with Guidebook. Your visitors can take photos and share them socially. The can view custom dynamic maps of your venue or location. They can search for nearby attractions, activities and restaurants that you want them to find. You can even give them airport information. Even better: you can give your visitors a tailored experience with easy-to-access information about your venue. A list of all the pieces in your gallery, along with descriptions? Links to the points of interest in your city? The sky’s the limit with Guidebook! Do you want to offer your visitors an app? We can help. Let us give you a personal demo.